Hubby and I are thinking of replacing our floor covering in the bedrooms. We are considering the new designs of floor vinyl covering. 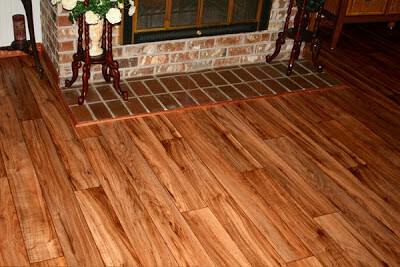 I was amazed to see some vinyl designs that really resembles that of a wooden flooring. When installed, you could hardly see the difference. There are various reasons why we are considering vinyl covering in the bedrooms. First, we don't want to create a lot of mess in the main living room and dining area when construction takes place. If we opt for tile covering, there might be a lot of mess as they need to apply concrete cement prior to tiles setting. Other than that, compared to wood, vinyl is easier to clean and manage. It doesn't require polishing or use extra ordinary cleaning products. It's also free from dents and cracks unlike tiles and woods. About the cost, I think it's relatively cheaper too, not to mention that it could easily be replaced when worn out which I think with proper care will still take so many years. All of the these factors convinced us that the modern designs of vinyl flooring that's out in the market today is still our best option in replacing our worn out floor coverings on bedrooms.